Avg. Group Discount of 12.7%! Expo Square, Tulsa Fairgrounds, BOK Center, ONEOK Field, Tulsa Air & Space Museum, Greenwood Cultural Center & District, Oklahoma Aquarium, Gilcrease Museum, Philbrook Art Museum, Cherry Street District, Big Splash Water Park, Tulsa Zoo, Mohawk Golf Course, LaFortune Golf Course, Sport Multi-Plex, Fair Meadows Horse Racing Track, local ball parks. 16-Jun-2018 Verified Review, stayed from Fri Jun 15 to Sun Jun 17 2018 at a $94.00 group rate. 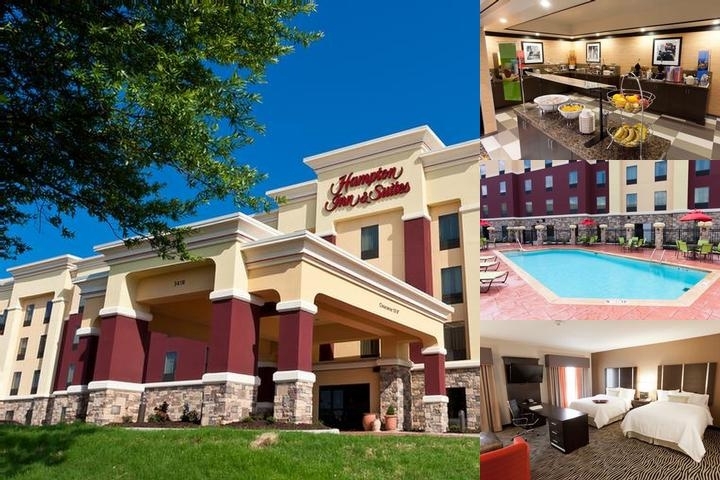 Hampton Inn Tulsa is located at 33rd & Memorial, 10 miles southeast of downtown Tulsa and just a short 4 miles south of Tulsa International Airport. Area attractions include Carl Smith Complex , Expo Center, Woodland Hills Mall, Philbrook Museum of Art, Gilcrease Museum, University of Tulsa, Discoveryland, Tulsa Zoo and Oral Roberts University. The hotel features 93 rooms, free parking and ample space for tour bus parking. Our outdoor pool provides an area to relax and unwind after a day of business or pleasure. On the House(TM) hot breakfast really gets your motor running with hot and tasty daily features. If you are in a hurry take advantage of our On-the-Go Breakfast Bags which feature a complete breakfast-in-a-bag that you can grab on your way out the door. In your room you will enjoy our easy-set clock radio, in-room coffee makers where you can brew the same blends of coffee featured at our breakfast, our free to use and easy to access high-speed Internet, a lap desk so you can work, write or read wherever you're most comfortable, comfy pillows, irons and ironing board and our newest features, curved shower rods which create more space in the shower, Waterpik® showerheads which make for a luxurious experience and fluffier towels to make you feel right at home. Nearby restaurants are Cracker Barrel, IHOP, McDonald's, Tiamo's Italian, TGI Friday's, Varsity Sports Grill, Romano's Macaroni Grill, Ruth's Deli and Pizza Hut. Laundry/valet services (minimal fee), mini microwave/refrigerators in most rooms, meeting/banquet facilities, refrigerators and rollaway beds are available free of charge. We are always conscious of our environment. We recycle our room keys and our paper, and we help conserve water by offering our guests the opportunity to reuse towels and washcloths. We also use energy effecient light bulbs throughout our entire hotel. An outdoor pool surrounded by chaise lounges, tables and umbrella shades in a garden setting. Tulsa International Airport is just 5 miles away. Local Shuttle Info: Taxi service is available to/from the airport for an estimated fare of $20 one way. Uber is also available. Shuttle will be coming in 2019! Complimentary hot breakfast to include coffee, juice, cold and hot cereals, pastries, waffle station, and a variety of hot items daily. Free high speed internet throughout the hotel. 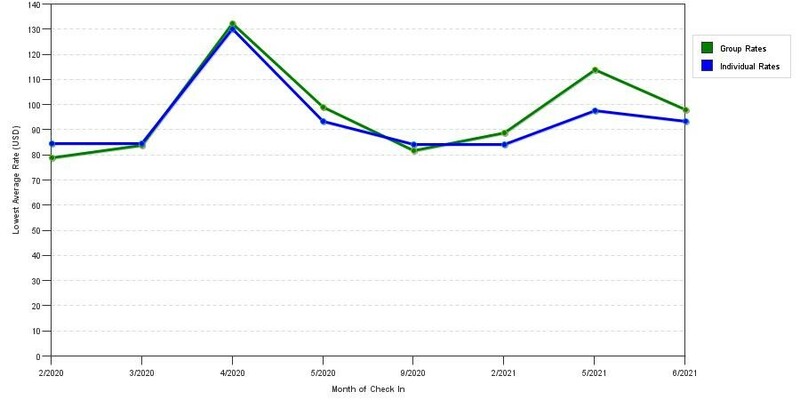 The graph above is trends of room rates for both group/meeting quotes and the lowest online individual prices our system could find at the time the group offer was entered. The most competitive group or meeting displayed is 25.9% in the month of April 2019 and the highest average individual rate is $126 in the month of April 2019. This chart will show past seasonality and also project future months. If you are flexible with dates, you may want to consider staying at Hampton Inn & Suites Tulsa Central in a month when rates are lower. 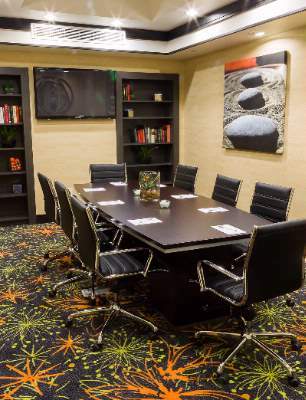 Below are the meeting, banquet, conference and event spaces at Hampton Inn & Suites Tulsa Central. 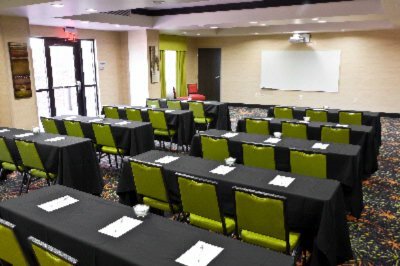 Feel free to use the Hampton Inn & Suites Tulsa Central meeting space capacities chart below to help in your event planning. Hotel Planner specializes in Tulsa event planning for sleeping rooms and meeting space for corporate events, weddings, parties, conventions, negotiated rates and trade shows. 39 x 28 x 9 Ft.
21 x 12 x 9 Ft.